Disturbance shapes the character and composition of ecosystems and it is “a pervasive feature of forests” (Perry 1994). Wildfires, blowdowns, pests and other disturbance agents affect the spatial patterns of vegetation and ecosystem processes, creating a diversity of conditions across the landscape, and they can leave an imprint that shapes forest dynamics for decades to centuries after the initial disturbance event (Turner 2010). 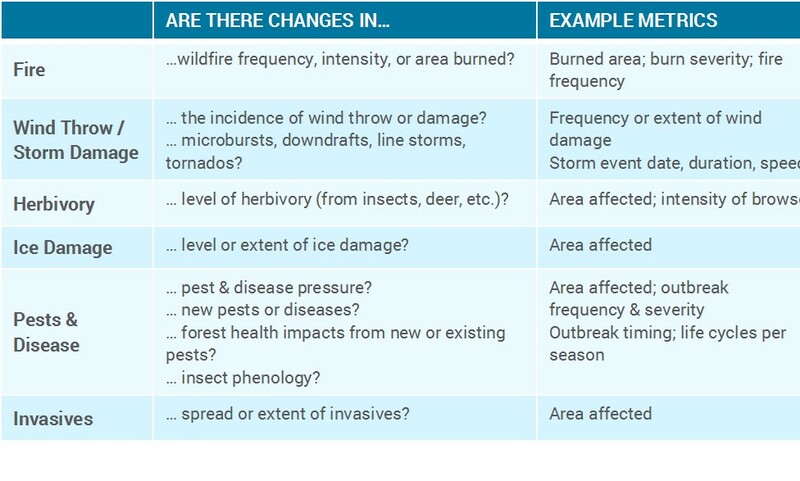 There is an increasing amount of research on forest disturbance in a changing climate, including a number of studies that suggest certain types of disturbance (e.g., wildfire or insect outbreaks) are increasing over time (as noted in previous bulletins). In a recent review in the journal Nature Climate Change, researchers noted that increases in the occurrence and severity of forest disturbance have been documented worldwide and they provide a comprehensive analysis of these changing dynamics by elucidating global trends from hundreds of separate studies (Seidl et al., 2017). Researchers synthesized results from over 670 studies (published from 1990 to the present) that assessed how forest disturbance changed in response to a change in climate, focusing on six disturbance agents (fire, drought, wind, snow and ice, insects, and pathogens). From these results, they isolated over 1,600 observations for further analysis. For each type of disturbance, they looked at the evidence for direct, indirect, and interaction effects of climate change. They determined whether climate change had a predominantly amplifying or dampening effect on disturbance, as well as the relative size of that effect. This allowed them to assess the degree of climate sensitivity. In particular, they examined whether disturbance was likely to increase or decrease under either (1) warmer and wetter or (2) warmer and drier conditions. Note: The disturbance agents included in this study have been discussed in previous CSLN bulletins, including wildfire (Part I & Part II), drought (here & here), wind, snow and ice (Part I & Part II), and pests/pathogens. Refer to those publications for a more in-depth discussion of climate change effects. 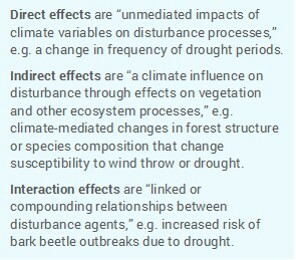 Climate has a “substantial influence” on forest disturbance – direct effects were most common (~57% of observations), followed by indirect (25%) and interaction (~18%) effects. Temperature had a greater influence on disturbance at higher latitudes (most important in boreal regions), while water availability was more influential at lower latitudes (most important in the tropics). Interaction between agents tended to increase disturbance – posing an increased risk of crossing ecological tipping points. g. a climate-mediated shift toward more drought tolerant tree species reduces potential for drought-induced forest mortality. It can take years to centuries for the disturbance regime to respond to the change in climate. g. drought weakens tree defenses, leading to an increased risk of bark beetle outbreak within a few years. g. a forested area becomes progressively drier over time, leading to self-thinning and a reduction in stand density (after many decades), which reduces risk of wildfire. Studies indicate disturbance activity will increase in all biomes and more for conifer forests than broadleaved and mixed forest types. Overall, disturbances from fire, drought, wind, insects, and pathogens are likely to increase, while disturbances from snow and ice are likely to decrease. Longer term effects of climate change on disturbance regimes may be underestimated because the analysis is limited by the length of the observational period used in the original studies. The predominance of direct climate effects may be partially due to the fact that they are easier to detect and measure than indirect or interaction effects. The majority of observations they analyzed were from ecosystems in North America and Europe, making it unclear whether some of the observed trends (e.g. greater impacts on disturbance in boreal regions) are due to the degree of climate change and ecosystem characteristics or (at least partially) the result of publication bias. The scientific literature focused more on fire, drought, insects, and pathogens than the other disturbance agents. Invasive alien pests were not considered in their analysis, but will likely play a part in future disturbance change. Forest management can ameliorate negative impacts from increasing disturbance, by actively promoting the characteristics of resilient forests, and shifting species composition, stand density, and other features in a way that reduces vulnerability to disturbance and ensures that when disturbance (inevitably) happens the damage is minimized. Building wind firmness in older and developing stands to minimize damage from wind and ice. Increasing resilience to future drought events by promoting regeneration of drought-tolerant species and thinning to reduce stand density. Reducing fuel loads and forest density to decrease wildfire risk. Preparing staff and equipment for increased fire potential. Perry, D.A. 1994. “Disturbance in Forest Ecosystems.” In: Forest Ecosystems, p. 127. Baltimore, Maryland: Johns Hopkins University Press. Seidl, R., Thom, D., Kautz, M., Martin-Benito, D., Peltoniemi, M., Vacchiano, G., Wild, J., Ascoli, D., Petr, M., Honkaniemi, J., Lexer, M.J., Trotsiuk, V., Mairota, P., Svoboda, M., Fabrika, M., Nagel, T.A., Reyer, C.P.O. 2017. Forest disturbances under climate change. Nature Climate Change. 7: 395-402. Turner, M.G. 2010. Disturbance and landscape dynamics in a changing world. Ecology. 91(10): 2833–2849.